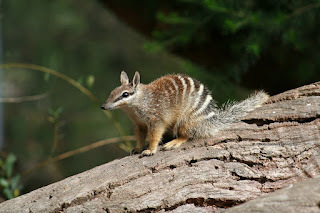 The numbat also known as the banded anteater, marsupial anteater, or walpurti, is a marsupial native to Western Australia and recently re-introduced to South Australia. Its diet consists almost exclusively of termites. Once widespread across southern Australia, its range is now restricted to several small colonies, and it is listed as an endangered species. 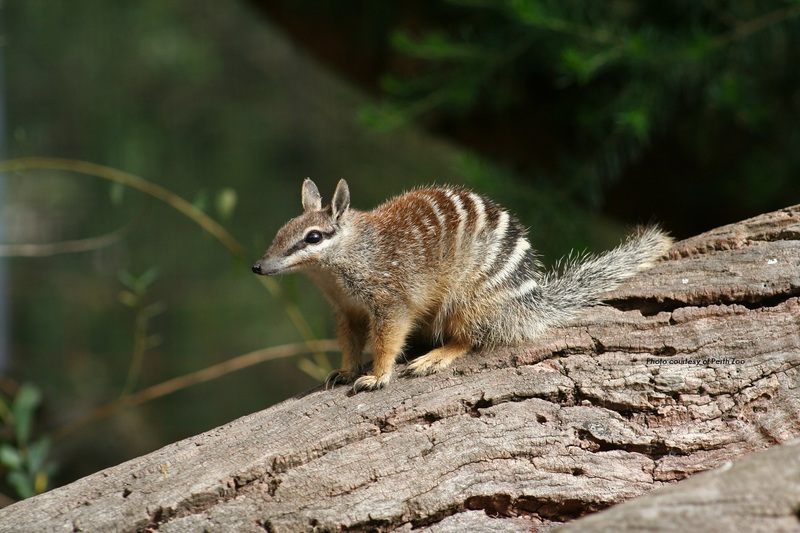 The numbat is an emblem of Western Australia and protected by conservation programs. Numbats were formerly found across southern Australia from Western Australia across as far as northwestern New South Wales. However, their range has decreased significantly since the arrival of Europeans, and the species has survived only in two small patches of land in the Dryandra Woodland and the Perup Nature Reserve, both in Western Australia. In recent years, however, it has been successfully reintroduced into a few fenced reserves, including some in South Australia (Yookamurra Sanctuary) and New South Wales (Scotia Sanctuary). Today, numbats are found only in areas of eucalypt forest, but they were once more widespread in other types of semiarid woodland, Spinifex grassland, and even in terrain dominated by sand dunes. 20–29 cm long plus a tail 12–21 cm long. Numbats breed in February and March, normally producing one litter a year, although they can produce a second if the first is lost. Gestation lasts 15 days, and results in the birth of four young. Unusually among marsupials, female numbats have no pouch, although the four teats are protected by a patch of crimped, golden hair and by the swelling of the surrounding abdomen and thighs during lactation. The young are 2 cm (0.79 in) long at birth, and crawl to the teats, and remain attached until late July or early August, by which time they have grown to 7.5 cm (3.0 in). They first develop fur at 3 cm (1.2 in), and the adult coat pattern begins to appear once they reach 5.5 cm (2.2 in). After weaning, the young are initially left in a nest, or carried about on the mother's back, and they are fully independent by November. Females are sexually mature by the following summer, but males do not reach maturity for another year.